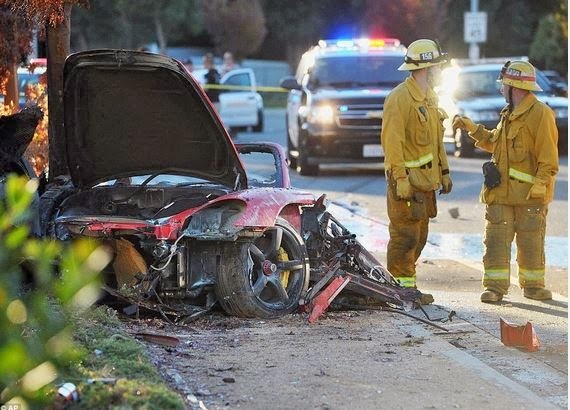 This is all that remained of the red 2005 Porsche Carrera GT driven by World Challenge driver Roger Rodas and “Fast and the Furious” star Paul Walker. They both died this Saturday, November 30 when Rodas lost control of the car and wrapped it around a tree. The Porsche burned down (footage was captured on camera, easy to find on Google). This is very unfortunate. By all accounts, Paul Walker is one of the most likable Hollywood actors: good-looking, successful, humble, 8.3 million Likes on Facebook (picked over a million more just today). The story makes for big headlines and you are likely to see "Fast and Furious Star Dies in Fiery Crash" on the front page of every major news site. It is hard to understand how an experienced race driver like Rodas could lose control of the car like that in broad daylight on a dry road. There might have been a mechanical or some distraction around (the accident happened very close to a charity event the two friends were organizing). It's safe to say from the wreckage that they must have been going very fast for a car to get wrapped around a tree like that. The Fast & Furious sequel has already grossed Universal Studios $2.4 billion and it has become its biggest franchise of all time. A movie that started a subculture has turned into a mainstream series. A young actor who dies James Dean-style will make the series ever more popular.